اليوم نضع الكثير والجميل من رسائل عيد ميلاد مضحكة بالانجليزي، ستكون تجربة جميلة ومميّزة عند التعبير للصديق وللحبيب ولأي شخص يحتفل بعيد ميلادة بطريقة مضحكة وباللغة الانجليزية، شارك اليوم الاحباء بعضاً من أجمل رسائل عيد الميلاد المضحكة حيث اننا وضعنا الكثير منها كي تتمكّن من الحصول على الرسالة المضحكة والمُناسبة كتهنئة في عيد ميلاد أي شخص. الأن كُل ماعليك سوى قرائتها وإختيار الرسالة المضحكة والتي تُناسب الشخص المستقبل، الكثير من الأشخاص يستخدمون رسائل مضحكة في عيد ميلاد بالانجليزية كي يُدخلون الفرحة والسرور أكثر. 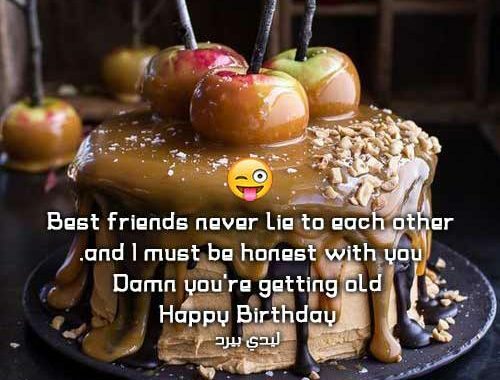 Best friends never lie to each other and I must be honest with you. Damn, you’re getting old. Happy Birthday. Happy birthday To the new wrinkle on your face. Welcome to another set of gray hairs on your head. Late in the evening, Far, Far away, there is a glow beyond the horizon, and I know deep in my heart It’s your Birthday Cake. Usually wisdom comes along with age It look like you haven’t reach that age yet. Happy Birthday. The wrinkles on your face say that you are old, your maturity levels say that you are a teenager while your birth certificate says something completely different. What should I trust? Happy Birthday. On your birthday I want to wish you success, wealth and fame so you can give us expensive gifts and invite us to luxurious parties. Happy Birthday Mate. Inside every older person there is a younger person wondering what happened. هذه تهاني انجليزية مضحكة في عيد ميلاد أي شخص، تُناسب الجميع وتُناسب اي مكان توضع فيه لأنها قصيرة وجميلة، شاركها على شكل حالات واتس اب أو منشورات فيس بوك و تويتر الخاص بك. I didn’t forget your birthday, I just forgot today’s date!. The best birthdays of all are those that haven’t arrived yet. هنا وضعنا رسائل عيد ميلاد جميلة ورائعة ليست مضحكة بل جميلة وتُعبّر لك عن الحُب والسعادة لعيد ميلاد شخص ما، شاركها اليوم مع الزوج او الزوجة أو لأي شخص. Your birthday brings in amazing benefits your company, delicious food, new friends, melodious music – bring it on! Happy Birthday. You are the master of many, I love the way you make friends and keep them for years so many. Happy Birthday. With you, no minute spent is same, it is always what next. Keep it happening, Happy Birthday. One great year, leads to another. Happy Birthday. Another happy year of smiles and joys! Happy Birthday. Happy Birthday to someone who defines being exceptionally articulate and overwhelmingly smart. Have fun.